Trying hard to combat all these fast Combo decks. So one of our friends on the cEDH discord, buildingadeck, made a budget version of this list and we wanted to credit him and share his efforts. The basic plan of Keranos is to get Keranos onto the field quickly followed by locking the board down with stax pieces. We then get card advantage or board control from Keranos. From that position we work to get our combo out. For Keranos triggers, we want to point damage at removing creatures on the battlefield or planeswalkers before we target players' life totals. 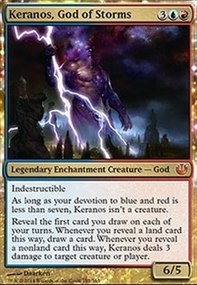 If there are no creatures or planeswalkers on the battlefield we would like to draw as many extra cards with Keranos as possible. Blood Moon/Magus of the Moon: Nonbasic mana bases are the norm for multicolored decks. Removing their ability to cast spells can be an instant win. This can hurt us however we can lower this by actively fetching out basic Islands. Back to Basics: This can act as a more punishing Blood Moon. This one does hurt us more though and we need to be careful with what lands we fetch for and when we deploy this. Cursed Totem: Removing Mana Dorks from the equation slows people down even more, the fact that they require a turn before adding mana means that we can land this after a bunch of them hit the field for some extra pain on our opponents. Trinisphere: Raising the cost of every spell to three, especially when cast on turn 1-2 can outright lock out players. If they kept a land light, mana rock heavy hand this can turn their fast start into a full stop. Winter Orb/Static Orb: Limiting the amount of mana players have is our go to strategy, this is our primary means of attacking basic lands. One noted missing piece of redundancy is Rising Waters, this did not make the cut due to its casting cost. Grafdigger's Cage, Torpor Orb and Arcane Laboratory: These are aimed at competitive EDH strategies as a whole, they are very catch all hate pieces and prevent most options opponents have to combo out a victory or to remove our stax and hate pieces. This deck runs Simian Spirit Guide, Mana Vault and Grim Monolith as we actively aim at pushing out a early advantage and riding it for a while. We have a large suite of mana rocks in addition to As Foretold. Although hyped and controversial, As Foretold has a home in this deck. We can land it and a stax lock down early then ride it as a mana source into the rest of the game. Outside of mana rocks which are not hurt by the majority of our mana denial suite, we have Isochron Scepter + Dramatic Reversal and Paradox Engine. Our planeswalkers also get to shine here. Dack Fayden can steal artifacts to both slow an opponent and accelerate us. Tezzeret the Seeker , when not tutoring us a win, can also untap mana rocks to help us break the mana parity. We have multiple ways to address board control. From large sweepers like Decree of Annihilation, which can either by cycled or hard cast, and Cyclonic Rift to smaller pieces of target removal like Lightning Bolt, Capsize and Keranos, God of Storms which can remove creatures from the field or pressure planeswalkers. In addition to pieces of removal we have a fair sized counter suite. The primary combo for the deck is Paradox Engine, mana rocks that tap for + mana and Isochron Scepter with a Lightning Bolt imprinted on it. We also have a soft lock with Paradox Engine, mana rocks that tap for at least and Capsize. Outside of combo, it is a very common occurance for devotion to be high enough that Keranos can attack players and pressure life totals. This is usually after a Wildfire or Decree of Annihilation has gone off. Of note, when hard casting Decree, Planeswalkers and Enchantments are left on the battlefield. As long as your Devotion to Blue and Red is not at 7+ Keranos will stick around and can either dig you into more cards or start plinking away at your opponent's life totals.